Does this tool allow me to find special blocks like command blocks? Yes, under the block filters, you would add a new filter minecraft:command_block and it would display where it is (if you turn off all the other filters). Very happy to see this is still being maintained Thanks for the new release. Could anyone point me to what I need to edit to have the most recent BoP blocks colored properly please? There are a bunch of biome colors and blocktype entries at the beginning you can ignore. The blocks are listed by number, then by NBT data, so any sub blocks of that type have their own color. An asterisk means any subtype of that block ID will have that color. It's just a matter of transferring the information from one file to the other to have all the block types colored according to the current texture pack in Unmined. A spreadsheet like Excel can make this much easier to do. Just replace the ff at the beginning of the hex number in the Map Writer list with a # in the Unmined list for the color to be input correctly. 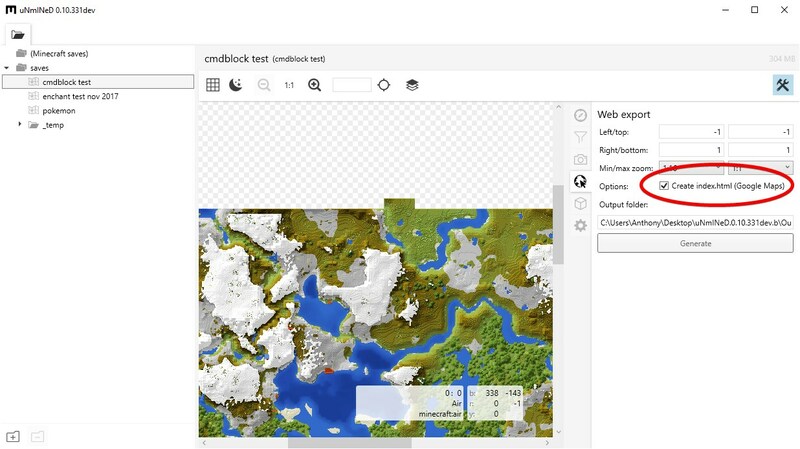 Megasys has mentioned adding Map Writer support in a new version, let's hope he finds time to do that, it would be cool. Yes, you can use the block filter to turn off specific block types, but getting them all off except one is a bit time consuming, I don't recall a specific way to turn off everything at once, just certain types. It's been a while since I did anything like that, so I'm a bit fuzzy on the details. I have an issue with trying to export a 1.10..2 world out as a PNG, the application just crashes! Unhandled exception. Details are saved to crashlog.txt. System.Reflection.TargetInvocationException: Exception has been thrown by the target of an invocation. ---> System.OverflowException: The image data generated an overflow during processing. ---> System.ArithmeticException: Overflow or underflow in the arithmetic operation. It allows me to export a 1.9 world, so I assume its something to do with new blocks, would this be possible to fix please? How the heck do I keep filters? It seems whenever this program loses focus (i.e. I alt-tab to another window or just click on another window) it refreshes and I lose my custom filters. I also can't turn off all of the filters. Is there a way to set the map center when doing a google map export? My map just shows up blank when the page loads because the default center (probably 0,0) is very far away from the terrain shown in the map. I always have to pan and zoom to find the terrain. 1.12.2 Still can not export an image without it crashing, can we get a quick fix please? I just want to export an image of my world, even if there are pink bits from textures not included. I think that's an overflow error because the image is so large. Doesn't Unmined have and option to export a part of the map only? Or export as a google maps set of files that can be opened in a browser? I seem to recall it doing something like that for really large maps. I've tried generating the map with the Google Maps option checked, although I'm not sure how to get to the Google Maps? I've gone to the folder it says it's output to but all that's there is a bunch of tiles at various zoom levels, which I assume are supposed to make up the map? But no full map. I'm very confused. There should be an index.html file in the root folder somewhere. Open that in a browser to view it. What do you mean by root folder? There's no root folder in the package the app comes in, and when I go to the output folder for generating the map/web file there is just a folder named "tiles", which then opens up to various folders named "zoom.0" through "zoom.-4", and then inside those various folders named various different numbers... which then contain more numbers... which then contains the pictures of the map. I can't do anything with all these fragmented puzzle pieces as far as I know. Odd, there should be other files alongside the "tiles" folder. Perhaps there's a bug in that version? EDIT: Did you check "Create index.html (Google Maps)" in the Web export options in Unmined? I'm absolutely sure I did, but no luck. I'll try again with it unchecked and see if anything changes, and if that doesn't work I suppose I'll try and redownload the program. index.html should open the map in your browser and work like any other google maps interface. I just created a map in 0.10.331dev.b and it works fine. OK, so here is my situation. You could create the google maps output and host it on a website but it wouldn't update automatically, you'd have to download the world save and create a new set of map files and upload them to the web server every time you wanted to change the map. I think there are mods/plugins you can run that will create a map on a webpage automatically, but I have no idea how they work or where to get them. But I've seen other servers have that option.